I actually didn't think it was possible to have an ethical and sustainable diamond of *any* kind. As soon a I knew Couple made that possible, it was an instantaneous decision. To be honest, I kind of look sideways at people who buy a mined diamond now. Like, what are you thinking? Not only do I strongly recommend it, but I lean in pretty hard on the sales pitch. To me, it's the only choice one should make when choosing a diamond ring. I knew very early on that my wife was the woman I wanted to marry and start a family with. We both felt that it was important to get married before having kids and we both were really keen on starting to have kids and build a life together, sooner rather than later! When it came to choosing an engagement ring, I couldn't say no to the price and quality combo of Couple. 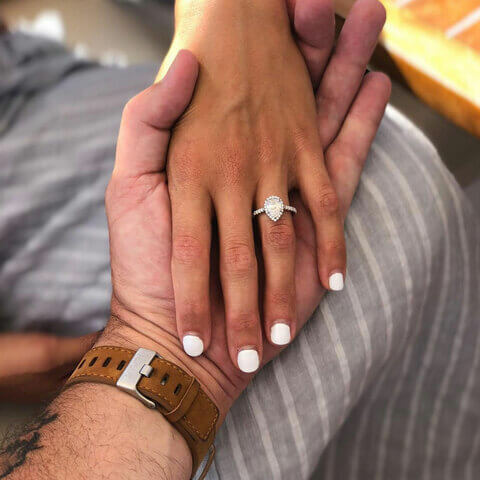 Buying mined diamonds is a scam, and it's important you pop the question with something that shows her how much you care. I had a general idea of what I liked, but my Couple ring is better than what I could ever have imagined. Very shiny, quite big and with the perfect shape and size. Everyone is curious to hear more about my lab-grown diamond story, and we are very proud to be an early customer of Couple. With lab-grown diamonds, you get so much more for your money. You also have the peace of mind of wearing something sustainable. I knew I wanted my engagement ring to be simple, elegant and timeless. What my fiancé picked out is perfection, from the slender band, to the quality of the diamond, and the small stones along the band. I also love that it came with a yellow gold band, and that he chose this for me. I absolutely would recommend Couple to a friend – in fact, I already have. Marriage was never very important to me, but meeting my partner changed my perspective on a lot of things, including getting married. To me, it's important we get married to bond the family unit. 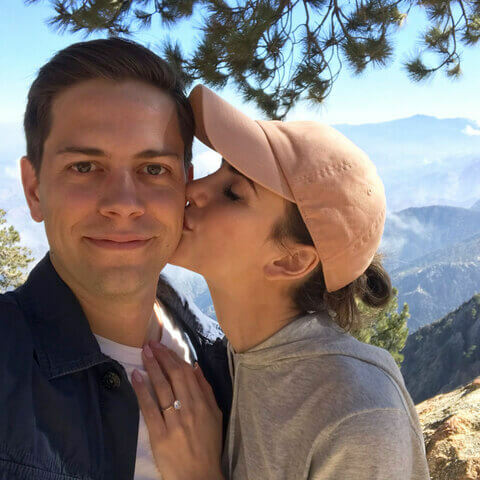 I’m so happy we went with Couple for my fiancé’s engagement ring – the quality is amazing and I love the environmentally friendly aspect. I always wanted a timeless and elegant ring. My first impression of my Couple ring was that it’s absolutely gorgeous. Its cut and clarity make it very reflective while still holding a simple elegance. I’m in love and get constant compliments on it. Would 100% recommend! My Couple ring is everything I never knew I always wanted. It's such a statement. I love educating friends and family on what lab-grown diamonds are all about. They’re virtually identical to mined diamonds but ethically and environmentally responsible, which I think is at the forefront of everyone's minds these days. It's a way to celebrate your love without guilt. 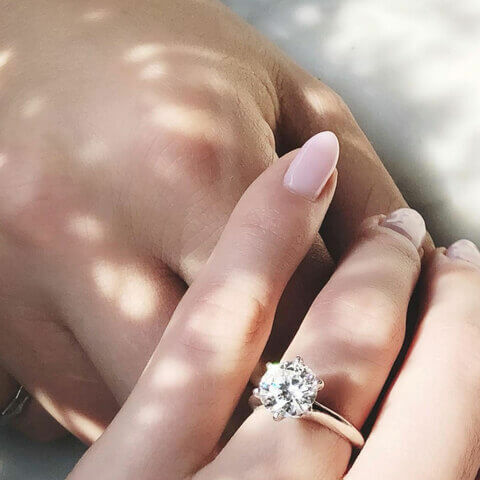 While we both knew we'd be together forever, with or without a ring, formalizing the commitment was a fulfilling step toward that long term vision. 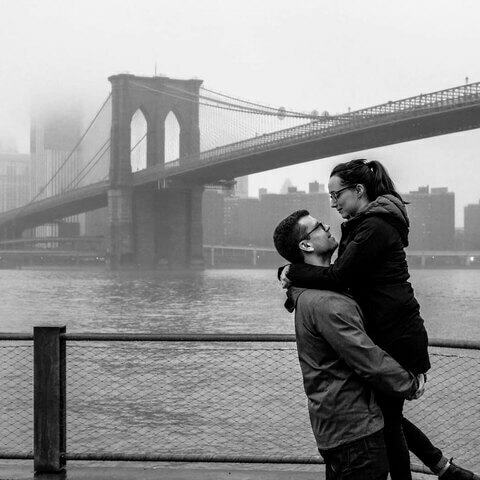 I would absolutely recommend Couple to anyone taking that next step and proposing – my fiancé loves her ring, and the process was so easy. I’m in Love with My Ring! My fiancé and I were discussing getting engaged, but I didn’t want to ruin the excitement of a proposal by meticulously picking out every detail beforehand. 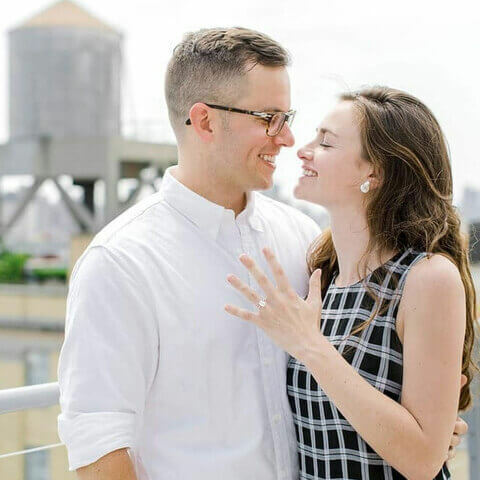 He proposed with a family heirloom, knowing we’d choose the perfect ring together. 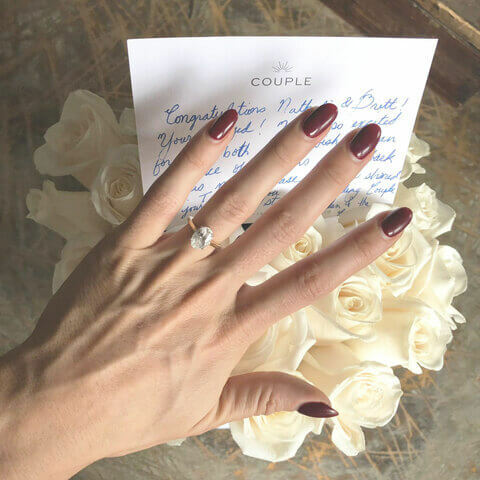 While that ring was gorgeous, I still wanted something more contemporary, so we chose our Couple ring together. It’s AMAZING!! It sparkles SOOOO much. It's absolutely perfect and I love it. It gave me so much peace of mind knowing Couple has an expert jeweler reviewing the diamonds. We've been together for 5 years. Marriage was simply a symbol of what we both already knew. Leading up to it, I wanted the proposal to be as much of a surprise as possible. Shopping for the ring, I knew I made the right decision with Couple. I got a great carat weight for the price, and I love knowing that no people were exploited like with mined diamonds.